News today is a very good one. Digiarty the generous company is giving away its $39.95 iPhone file manager& transfer tool to anyone who has a need to transfer and manage iPhone files. That’s a timely help since by most accounts file transfer between iDevice and computer is not an easy task. 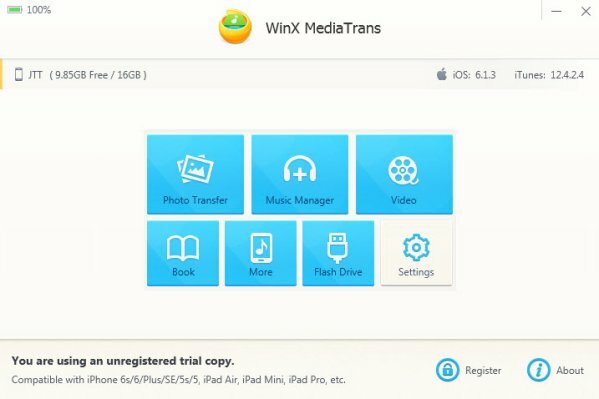 Now you have a chance to grab WinX MediaTrans and let it transfer your music, photos, videos, podcasts and e-books, etc. between iPhone/iPad and PC quickly for absolutely free. Let’s know something about WinX MediaTrans first. Strengthened by technologies like Intel QSV and Nvidia NVENC hardware acceleration, this iPhone/iPad manager outshines many other tools especially in the file loading and transferring speed. Exporting 100 4K iPhone photos takes only 8 seconds; transferring a feature-length movie, just a few minutes. Those relatively smaller files like PDF and e-books can be flawlessly transferred between iPhone and PC in the blink of an eye. Now you may want to have a try of this ultra-fast file transfer tool. Just go to the following page and find “Get Giveaway Key”. The code will show up after you sharing the news with your Facebook or Twitter friends. 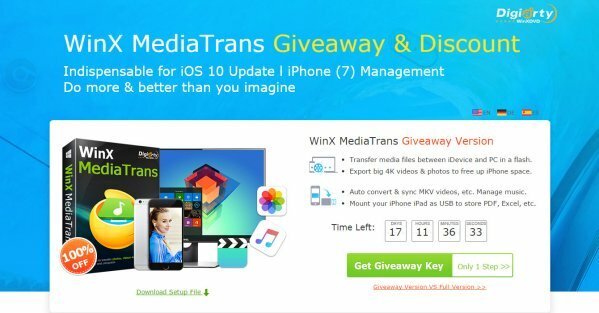 It’s necessary to know the differences between the giveaway version and full version of WinX MediaTrans. Though both of them enjoy full functions including transferring, managing, converting iPhone files, the latter enjoys an extra free lifetime upgrade, tech support and some other privileges like 30-day money-back guarantee. File transfer is certainly the first specialty of WinX MediaTrans. You will find almost all of your iPhone files such as photos, music, videos, podcasts, e-books, and even audio books and voice Memo, etc. on its transferring list. It will automatically detect your device and prepare a transferring plan for you. Video files cannot be recognized by iPhone? Don’t worry. This 2-in-1 iPhone video transfer &converter tool auto converts your videos in FLV, MOV, AVI, MKV, etc. to iDevice supported format. Just drag a video from your computer folder or desktop to its interface and tap on “Convert”, you will get a universal MP4 video which can be played back on almost any devices including iPhone, iPad. Bought a new album on iTunes shop? Then you will want to transfer the songs to your iPhone for enjoying on the go. With this iPhone music manager, you can easily add a new playlist on iPhone to store them. It also allows you to delete or rename a playlist in simple method. If you want to modify the artist name or album name, you will make it in a very short time with WinX MediaTrans. Can’t find the photos taken during last summer vacation? Relax. Just connect your device to computer. This powerful photo transfer tool will divide your iPhone photos into groups by date/month/year, so that you can export selected photos to back up them on computer without worrying about a complete sync. Additionally, this iPhone manager can turn your iPhone/iPad as free USB when you want to copy some documents, Excels, etc. Many other features like auto rotating videos to adjust your device screen are also very useful as far as I can see. Now that you can save $39.95 and get a functional file transfer tool for free in this giveaway, why not grab it and freely manage and transfer your iPhone as soon as possible?